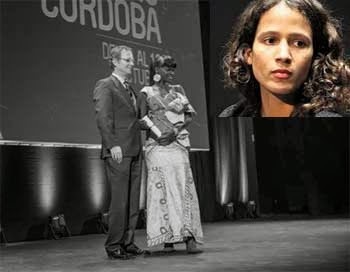 At the closing ceremony and the presentation of the Griot Awards, the documentary Mille Soleils (2013), having already received the FIB Marseille 2013, wins the Griot for best documentary. Cited from an earlier Le Quotidien article: “The young filmmaker, daughter of musician Wasis Diop and niece of the renowned Senegalese Djibril Diop Mambety, reconstructs the masterpiece Touki Bouki (1972) directed by her uncle Mambety, to explore the personal and universal legacy of the cult film Touki Bouki through the character of Magaye Niang, the actor who embodied Mory, the protagonist of the film in 1972. The jury that presented the award to Mille Soleils (Thousand Suns) by Mati Diop emphasised, “its force and relevance to our times; acclaiming an innovative film that combines tradition and modernity with great finesse. With superb creativity the film conveys the extent in which the ties to the past opens new paths in the present and how its valuable insights may energise the future”…the film allowed the spectators to observe the evolution of the Mory character, who in Mille Soleils is now called by his name, Magaye Niang. Yet, his personality is really influenced by the personage of Mory. He notes that, even though receiving an offer to go to Hollywood to continue his career, he got lost along the way. In the documentary, Mati Diop is surrounded by Magaye Niang and other actors as they reflect on the success of Touki Bouki, already known for its reflexivity and poetic avant-gardism. The spectator discovers what has happened during the last 40 years since the voyage of the hyenas, Touki Bouki”.